The Henry Fowler residence once stood at the corner of se corner of Main and Armour, serving as a union hall after 1940 and demolished in 1995. Today’s historical post looks at the block from Armour to 36th Street, from Main to Walnut, a block that undertook a radical transformation in a few brief decades. From an exclusive enclave of wealthy families like the Armours in the early 1900s, the block became a center of culture around the Conservatory of Music in the 1940s, as Main Street moved from a block of fine homes to a major commercial corridor. The former Fowler residence in 1969. As part of our Uncovering History Project, the Midtown KC Post is taking a look at each block in Midtown, including a set of 1940 tax assessment photos which is available for many blocks. (Many people seem confused by the tax assessment photos, which all include a man holding a sign. Here’s the story behind them). 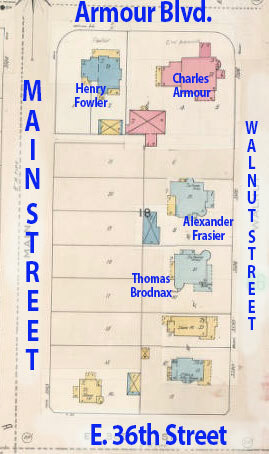 This week, the block from Armour Boulevard to W. 36th Street, from Main to Walnut. 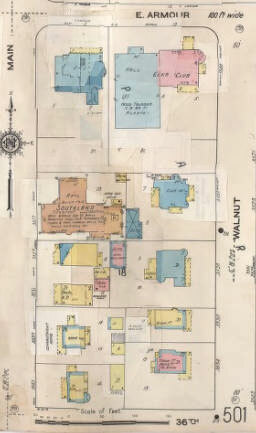 This 1895-1907 Sanborn Fire Insurance map shows the block in its early years. For a brief period in the early years of 1900, there was not a more prestigious area of Kansas City than Armour around Main Street. The Armours of the famed meat packing company built luxurious homes on the north side of street that took their family name. On this block, Charles Armour had his home at the corner of Armour and Walnut. On the other side of Armour, his brother Kirk Armour had built his mansion, and other family members moved in nearby. Next door lived grain commissioner Henry Fowler. Along Walnut Street to the south, millionaire Alexander Frasier, who owned the Argyle Building at 12th and McGee and a large interest in the Elm Ridge race track property, lived until his death in 1911. Another of the large homes on Walnut was built for the Armour Company’s J.W. Strong Reid, who sold his home in 1903 when he was transferred to Chicago. Grain trader Thomas Brodnax bought the home that year and occupied it at least through 1930. This 1955 newspaper photo shows the Conservatory of Music annex at 3522 Walnut, with the Conservatory (the Charles Armour home) in the background. The same block in a 1907-1950 Sunburn map. Change came in the 1940s for several reasons. The families who had settled on the block moved south as the city expanded. Their large homes, left behind, became ideal spots for cultural institutions looking to expand in Midtown. On this block, the Conservatory of Music, started in 1907 downtown, moved into the former Charles Armour mansion. In 1944, the thriving conservatory acquired the former Frasier home to the south, which had been used as a restaurant before becoming the music school’s annex. 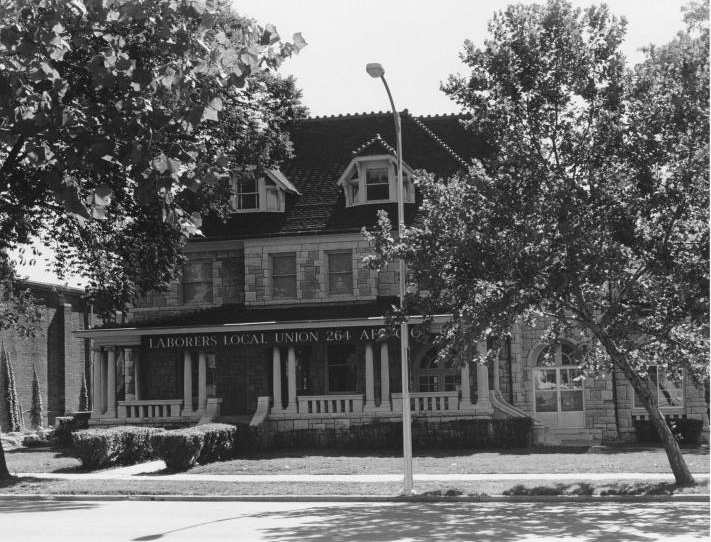 Also in 1944, Fowler’s home was purchased by the General Laborer’s Union, part of a trend that saw labor-related organizations moving into the area of Armour east of Main and Linwood west of Main. It remained a Union Hall until 1997. 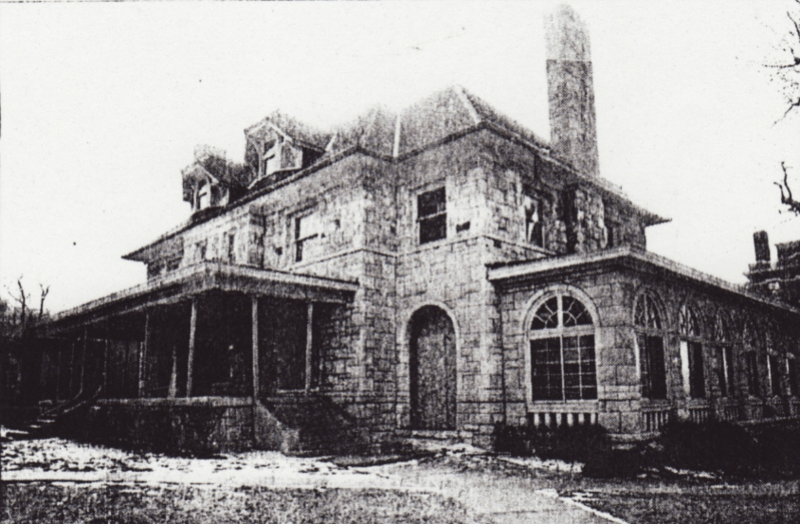 Although the home was on the National Register of Historic Places, it was demolished that year to make room for a new research laboratory for Interstate Bakeries. The slideshow below shows the remaining buildings on the block as they looked in 1940.